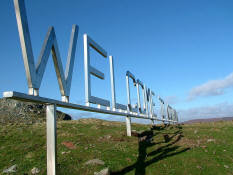 Hard thing to photograph, the new, shiny and absolutely massive, WELCOME TO NORTHMAVINE sign, at the isthmus called Mavis Grind which marks the start of our little community in the north mainland of Shetland. So hats off to the Shetland News for having a nice one and the full story of its manufacture. I went to the sign's grand 'opening' (it would have been an unveiling, but the wind was too...windy)on Sunday with James and Martha, who are both activists in 'Da Young Eens Fae Nort' youth development group. It's an amazing sight, based on the Hollywood sign, but less intrusive. It sort of shimmers away into the hillside. Afterwards, we had a choice of Sunday tea action, as there was sign-celebration activity at the Sullom Hall, AND the legendary Ollaberry Hall teas a bit further north. We plumped for Ollaberry - too many politicians at Sullom, all manouevring for votes in Thursday's council elections. I sincerely believe that the best cakes in Western Europe, and possibly the world, were being served in Northmavine on Sunday. And I ate a great many of them. Audrey, Susan's mum, died yesterday afternoon. She was 84. It has been a week of waiting, with Susan and her sister Jane by Audrey's bedside in Brae's North Haven care centre every day. The funeral will be on Wednesday in Hillswick. I arrived back in Shetland on Friday morning to discover that Martha (12) was due to compete in the Shetland Young Fiddler of the Year competition that morning. Now she's quite a good fiddler, is Martha. Last year, she won the Intermediate/Traditional section of the competition, I thought deservedly, though obviously I'm biased. Watching her play last year, all alone, in Lerwick's Garrison Theatre, facing an audience and three impassive judges, was one of the most terrifying experiences I've ever undergone. I'm used to performing, have been getting up on stage since the age of 11, but the nervous energy and adrenalin is always spent by the act of doing whatever it is you have to do: singing, talking, broadcasting. Watching Martha, I had all the nerves, all the blood-pumping fear, and nowhere to put it but applause. Anyway, last year she won. This year, ineligible for the Intermediate/Trad category (unaccompanied Shetland 'listening' fiddle tunes) she entered the Intermediate Young Fiddler section, which demands piano accompaniment. And during her second tune, Debbie Scott's rather demanding but beautiful 'Fiddle', it all went wrong. There was a misunderstanding between Martha and her accompanist and the performance simply fell apart. To say the least, Martha was upset. I couldn't find her afterwards and it took ages to discover that she had been waiting, alone, backstage. I tried to explain that all of us face experiences like that in our lives, that failure at this level did not mean she wasn't a terrific fiddle player. I told her the story of my band's crucially important performance at the Greenbelt rock festival in 1982, when a capo on the wrong fret turned our first number into an excruciating cacophony of screeching horror, from which we never recovered. In front of 10,000 people. But what I wanted to say was that I have always felt uneasy about these public musical competitions for children, this parade of prowess, mainly for the benefit of teachers and parents. Although it has to be said that Martha was the one anxious to take part in this year's competition. And I was knocked out by the quality of many performers yesterday. However, this is not what music is, or ought to be about. I hate the snide comments passed by one or two fellow competitors (at least last year). I hate the look of naked fear you get on some children's faces. I felt all of this last year when she won (though goodness, I was proud of her) and this year when things went wrong. However, after yesterday, I did try to tell her that it would be wrong to pull out of the senior traditional competition she was entered for next day. Years younger than the top players taking part, she knew she had little chance of winning or qualifying for the final three. In her shoes, I'd have been flouncing off. I'm a good flouncer. And very experienced at it. But Martha didn't. She shrugged off her disappointment, practised, got up this morning ready for whatever the day could throw at her. Then she stood up on the stage and played. Not perfectly, but very well indeed. I couldn't have been more proud of her. Some of the other youngsters who played were stunningly good. I loved the music. But still, I couldn't help feeling it was the wrong context. Music is about telling stories, about dancing, about fun. Competitions are about terror and the risk of defeat. Yet I know that next year, Martha will want to have another go. Maybe she's just a whole lot tougher than I am. As well as more talented. Shooter: "The Bourne Identity without Bourne....or an identity.."
Thus spake erstwhile Guardian editor Peter Preston on BBC Radio Four's Front Row the other night. I wanted dismiss his comment as a well-worked journalistic cliche, but having seen the movie last night, he has it, err... bang to rights. Mark Wahlberg does that blank-faced automaton Matt Damon thing pretty well, and there are some exciting moments, but I kept thinking: I've seen this movie...the plot is very like one of the Lee Child books (The Hard Way?) but actually comes from a Stephen Hunter novel I fear I may have read. How many films/books are there where the damaged veteran retreats to the American wilderness only to be called back for One Last Job? Best line has to be: "They shouldn't have shot my dog". I really liked the dog. It made me (briefly) miss the St Bernards. Confusingly, unsteadily edited, with unexplained gaps and snippets that don't make any sense at all, the explosions and shootings just about carry it through. A natural for four-tins-in (all male) DVD sessions of a weekend. Seeing the film was a classic Clydebank experience: Walk out of the house I'm staying in, five minutes to the Empire at the Clyde Shopping Centre, take in the 20.40 showing, then wander through the 24-hour ASDA, pick up some organic carrot juice and a Chicken Primavera ready meal (very good), not to mention a copy of the new William Boyd novel for three quid (! )walk back to the house, no mugging or hint thereof. All this AND the World's Only Sail Through Chip Shop! A Toyota Tonka Toy Landcrfuiser, to be exact, belonging to my wife and On No Account To Be Scratched Or Dented While In My Keeping On Pain of DREADFUL REPERCUSSIONS! Hmmm...Edinburgh is no place for cars. It's ancient streets tie the traffic in knots, and this has been compounded by the city centre's omnipresent building work and some incredibly strange traffic management decisions. Two hours, leaving at 4.00pm, from The Tun at Holyrood to Byres Road. I couldn't be bothered doing that every day. Why the Landcruiser, you ask? Well, Susan had to go home, leaving her Beloved Vehicle in my hands. I had to go to Edinburgh to get young large James, deliver him and double bass to the NYOS course at Merchiston Castle School (normally a care home for posh people's weans, so I understand) and then do the radio show from Embra as well. All would have been straightforward had it not suddenly become apparent that James needed the following for the course: A music stand; a double bass stool; a pair of smart black trousers; a pair of black shoes; a pair of black socks; a plain navy blue tie; a white long-sleeved shirt. None of which he had with him. So I apologise to both communities for that last post. Geography was never my strong point. Susan's mum was taken very poorly overnight, and that meant that Susan's long-awaited Easter holiday was cut brutally short. As was poor old Martha's, who accompanied her on the last-minute flight home this lunchtime. Thank goodness for the Air Discount Scheme. I couldn't go because...oh, it's complicated: James is in Tenerife with a pal, he has to be picked up in Edinburgh on Wednesday for National Youth Orchestra duties, then retrieved on Saturday, and put on a 'plane home a week on Monday. There's no boat home for me until a week on Thursday. Barring emergencies. Anyway, Audrey (Gran) seems to be a wee bit better, which is good. I spent the afternoon perusing the delights of the Clyde Shopping Centre (Subway, Next Clearance, TK Maxx, Lidl, Aldi, Asda, Fopp - all the sweets of being). The availability of the new Lee Child/Jack Reacher novel in hardback for a tenner in Asda proved too tempting. I'm currently alternating Lee Child with TV coverage of The Masters, while gazing out at the distant lights of Port Glasgow. Augusta looks cold. Golf looks increasingly, pointlessly, like a computer game. Port Glasgow looks delightful at a distance. At night. ...but returning there on Monday night for the 'secret' John Martyn Band gig. Fine night was had (see Nippy Sweeties) by a roaring log fire, nattering with owner David Mundell about some of the many rock'n'roll characters who have played at this extraordinary howff. Would love to see how Peter Tork of the Monkees shapes up these days. Looks like Fairport Convention are heading to Glenfarg in the near future. Check out the Bein Inn website. 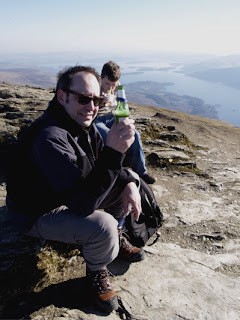 Sunday was beautiful almost beyond belief, and on top of Ben Lomond (me, Stewart and Magnus, five hours from Rowardennan to the top and back down....oh, my knees! )Stewart revealed that he had been lugging three bottles of Peroni the entire way. And a kilo of tsatsumas. And a Swiss Army Knife. Me, I just had a flask of Black Bottle. I'm not a Peroni drinker, but never has beer tasted so good.